The hills and valleys of Nevada County are brilliant green after a couple months of rain following a very dry winter. This is a perfect time to take a drive on the southwestern back roads of Penn Valley and Grass Valley, and to stop at a vineyard or two to give you a motivating destination. Mary and I took the back roads to Naggiar Vineyards on the two dates above to be assured of optimum beauty. It has since showered a few more times -- you can make the tour yourselves and see some of the same beauty. The route from Lake Wildwood is shown on the Google map below. 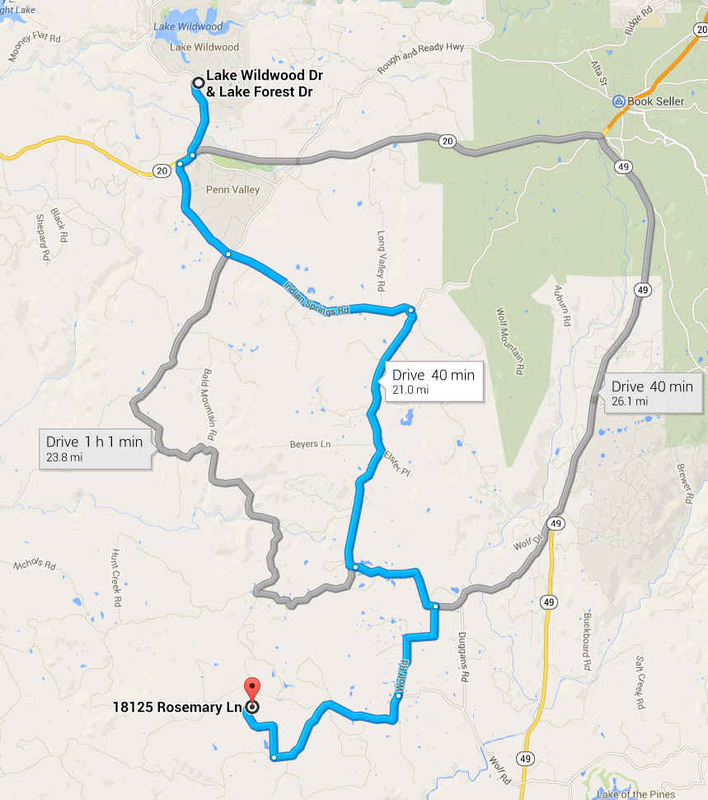 Drive down Pleasant Valley Road to and across Hwy 20 and then turn right and left (at 1.7 mi) onto Indian Springs Road. Drive 5.6 mi to McCourtney Road. Turn right onto McCourtney, which eventually becomes Lime Kiln Road just before the intersection with Wolf Road (at 7.0 mi on McCourtney). Turn right onto Wolf and continue to Naggiar Vinyards and Winery. Wolf becomes Garden Bar Road (at 2.1 mi) when you continue straight where Wolf takes a hard left turn at a stop sign (from the opposite direction). Continue 3.2 mi on Garden Bar to Rosemary Lane, turn right onto this dusty road and on to Naggiar (1.2 mi). Rosemary Lane is just a short distance beyond a one-way bridge, which you can use as a landmark that you are almost there. The entire drive is 21 miles (the sum of all the miles above) through beautiful country and takes between 40 minutes and an hour depending how slowly you drive to take in the beauty. From other places -- Grass Valley and Nevada City: Head to the Nevada County Fairgrounds, which is on McCourtney Road at Hwy 20. Drive on McCourtney past the Fairgrounds for 5 miles through beautiful horse country and you will pass Indian Springs Road. Proceed on the map below to Naggiar Vineyards. Auburn and points south: Drive north on Hwy 49 to Wolf Road. Turn left onto Wolf Road and proceed 3.2 miles to a T stop sign. Turn left onto Garden Bar Road and proceed via the map below to Naggiar Vineyards. Plan your trip to enjoy the tasting room and events at the winery. You can also enjoy excellent food at their bistro. See their Events Page for more info, and take some well-spent time to explore their interesting web site (link in the title line of this page). Route to Naggiar winery (in blue) and two lesser alternatives. Note that the blue route is the fastest as well as most beautiful route. Ranches along the above route to Naggiar Vineyards and Winery. As you walk toward the tasting building you are greeted by a few well placed statues and the Naggiar Vineyards wall on the right. put equal emphasis on the wall and the statue. This also flattens the background into closer view. Both shots are useful, the above to give the experience as you approach the scene and below to capture everything in one shot. When you turn to the left you see this entry fountain with the vineyards in the distance. A closer view of the vineyards as spring leaves burst out. Still closer view from another angle in the morning sun a few days later. is the tasting room and the other, shown here, is the Bistro. The beautiful Tuscan-inspired tasting room. Same room on the busy March 23 weekend. Mary Naggiar (center) is tasting room manager. Guests bellied up to the tasting bar. Naggiar is a young winery but developed explosively from its first planting in 1998 into a respected source of fine grapes and more than 20 fine wines, all made with estate-grown grapes. They created their first wines in 2003 and broke ground for their classic Tuscan-inspired tasting room in 2009. Soon the winery was voted best in the Sacramento region by KCRC-3 voters for four years running. The vineyard and winery are the passion of patriarch Mike Naggiar, a 32-year veteran of Hewlett-Packard. Prior to retiring in 2000 he set out on a 3-year search for a property suitable for 60 acres of vineyards. The vineyards sit on both the near and far side of the hill you see on an 80-acre plot, plus an adjacent 40 acres to the right. The enterprise is family run by Mike, his wife Diane, sons, daughters, and a nephew relocated from as far away as Montreal, Canada. When you visit you will find that the enterprise is still growing, now into an entertainment center that makes the winery a popular destination for locals and tourists alike. The tasting building looks out onto the large pond, bandstand, soft grass seating area, and vineyards in the background. Concerts are held every month and dances on the lawn every weekend, with live music from the patio (see below). This is part of the covered patio for guest picnics, and live music every Friday and Saturday from May to November 1. The grassy area is ideal for visiting families. Here, father is releasing a kite. The kite is airborn. The red building is the main building of the winery on the opposite side of the pond. Another family with creative toys plays on the grass. This is the scene in back of the tasting building. Statues and fountain as you leave the tasting building toward the parking lot. in full screen. Also, click for my roadmap to Nevada County vineyards more generally.